A hand extends from a cloud and firmly clasps an upright Sword. The gift of the Sword in this Ace is the intellect, logic, reason, justice and communication. The sky is crystal clear symbolising mental clarity. 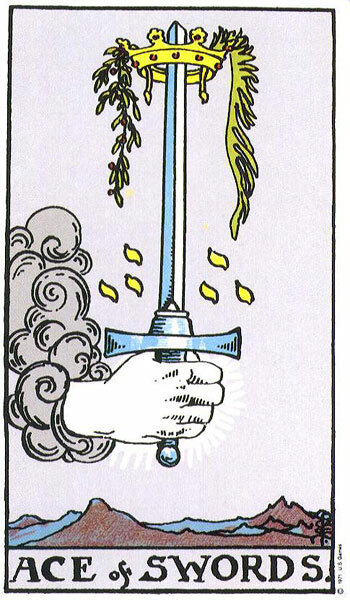 The Ace of Swords is one of only three cards that shows the Sword in the upright position. The other two are The Queen of Swords and Justice. The upright Sword displays its double blade indicating that this Ace brings with it the ability to see both sides of any situation. The Sword pierces a crown symbolising the Crown Chakra. The mind when clear, has the ability to pierce through the veil of illusion or facade to fully understand the situation for what it is. This Sword has razor sharp focus and its blade can cut through anything to get to the heart of the matter. The Sword focuses its attention only on what is important. As it pierces the Crown its message can be strong and forceful. It drives its point home and leaves no room for misunderstanding. Like a scythe that is used to clear a pathway through undergrowth and weeds, the Sword in this Ace can cut down and destroy old attitudes and mental processes which may be very painful to experience at the time but are necessary for our continued growth and mental health. Its blade clears the space for a new way of thinking and fresh approach. It provides the breeding ground for hatching plans, ideas and concepts. The Ace of Swords forces us to ask questions of our self and our life. It demands total honesty of us. This Ace helps you to focus on your own needs and what is right for you. It pierces through the darkness of your mind so that light can enter. Then you can see things for what they really are and not what you imagined they may be. No one can fool you or pull the wool over your eyes when you brandish this Sword. The sharpness of The Ace of Swords assists in severing any area of your life that is not worthy of you. This may be a relationship that is dragging you down, a job that smothers your intellect or a friend that fills you with negativity and depression. The Ace of Swords upholds the arm of the law and demands Justice of all who come in contact with it. If you have been wronged or those around you its energy will support you in standing up for yourself and what you think is right. The Sword in the right hand is very powerful but can quickly become dangerous if it falls into the wrong hands. When we take the Sword into our possession or when it is gifted us by spirit, we are asked to use it responsibly and wisely. A sharp mind and intelligence is a wonderful asset. The ability to effectively communicate our needs and feelings to others is essential. However, the sharpness of the Sword (tongue/hand) can hurt or cause deep wounds when we are careless and thoughtless. Therefore, the Sword should only be used to help and not hurt. 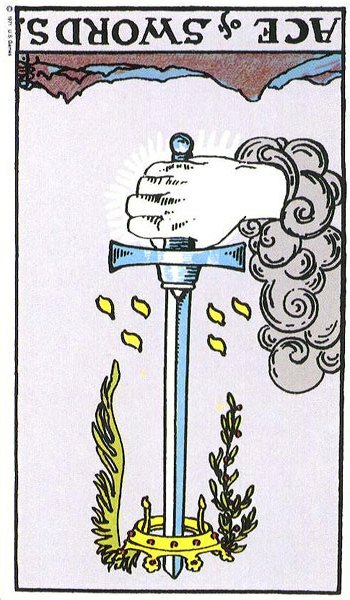 Just like the Ace of Wands, The Ace of Swords has phallic representations. Along with the Crown symbolically representing the Womb as the Chalice did in the Ace of Cups, conception can be suggested. The Sword piercing the Crown Chakra can also symbolise the spine and brain. Swords represent Autumn. The Ace of Swords announces the birth of intellectual energy, ideas, plans, vision, communication. Its presence suggests clarity of thought and mental prowess. You may be planning a new project or venture which is occupying your mind at present. Focused attention is necessary if you are to succeed. You must be clear of you intentions from the start and form a clear workable plan. The upright Sword is similar to that of the upright Wand signalling a green light, a go ahead sign. Whatever it is you are attempting, it is a good idea but it must be logical. The Ace of Swords often represents a new attitude replacing an old one. A fresh way of looking at things can bring clarity to the situation. With this clarity you can now see both sides of the situation. You are now in a position to judge wisely. Whatever the situation is it will call on you to use your reason and approach it in a logical manner. You must think with your head now and not your heart. You may find this very easy or very difficult to do. Mental sharpness and focussed concentration is necessary. Listen to both sides of the argument before making any decision. Find out the facts first and then use your head to sort any problems out. If you have been involved in ongoing negotiation or conflict, This Ace can signal a breakthrough as the Sword cuts through trivial issues to reach a balanced solution for both sides. The Swords Suit deals with matters of the law and legalities so the Ace may suggest the beginning of some legal issues for you. The pen is mightier than the Sword so to avoid misunderstandings, arguments or even legal action in the future make sure to get everything in writing before agreeing to anything. In a relationship reading the Ace of Swords can suggest a new relationship offering a meeting of minds with similar attitudes and outlook. It can indicate a clear understanding of what it is one wants from a relationship. The Ace of Swords brings great communication within a relationship and a couple who love to talk. Conception may also be indicated but look to surrounding cards to verify this. The New this Ace brings may be of legalities, contracts, letters from publishers etc. News can often be stressful and upsetting. In a Career reading the Ace of Swords would indicate a new career or position, which stimulates the mind and where much communication or talking takes place. You may have a clear workable plan for a project you are working on or you may be asserting your rights in the workplace. There is a wonderful sense of high career achievement with the Ace of Swords as the Suit brings with it a strong intellect and powerful mind. You may be pursuing a career in law, science or even writing for a living. You may have come up with a wonderful idea and the time has come for you to communicate it to others. The Ace of Swords can suggest surgery or accidents caused by sharp instruments. The reversed Ace of Swords brings delays or setbacks in plans. This may be caused by outside influences but on the other hand you may be concentrating all your effort on an unworkable plan. Your thoughts may be confused or you are trying to force things before they are ready. Stop moving the goalposts and allow your mind to settle. You may have to look at the possibility that old attitudes and outdated mindsets are clouding your thoughts and holding you back. The Reversed Ace of Swords can signal a ‘Red Light’. It can suggest that you stop what you are doing because it won’t work or is a bad idea. If you have been trying to deal with a problem it can point to the fact that you are going about it in the wrong manner. You have to think clearly now and stop wasting your energy on unimportant and petty issues. Decide on what really matters and base your approach on that. Regarding relationships there may be delays in entering one due to confusion as to what one wants. unfortunately the Ace of Swords reversed often highlights a pattern of conflict in relationships and this may vary in intensity. The cause may simply be different mindsets or interests but deep hostility and resentment may be at the root of it. Often the conflict comes from a lack of communication between a couple. Great misunderstandings can occur when our needs or feelings or not expressed. We then save up all the pent-up bitterness and confusion until a certain trigger releases it in a volatile outpouring of vicious comments and insults. These arguments are very rarely resolved but carried forward to add intensity to the next one. You may have a history of such relationships and need to think deeply about what it is that draws you to your partners. You also need to clarify what it is that you need from a relationship. The Ace of Swords reversed can suggest impotency or conception difficulties. This Reversed Ace will bring unwelcome news of law Suits going against you, fines, summonses, failed job interview or even a publishing company rejecting your manuscript. The news generally causes much distress and upset. The reversed Ace of Swords can herald the arrival of a challenging time in your life which will bring stress and worry. Career wise, you may be offered a new job but it will be mentally unstimulating. If working on a venture or project it would suggest you go back to the drawing board as some of the ideas put forward are not practical. A fresh approach may be necessary. With the conflict the Swords Suit brings, this Reversed Ace may speak of the beginning of aggressiveness and tyranny in the work place. Someone is laying down the law or forcing their way on others. This is bound to bring stress to all involved. It could be a new employee, boss or manager. If you are a writer or journalist then you may be suffering from a period of writers block. Take a break and let your mind settle. The more you worry, the less creative flow there will be. The Ace of Swords Reversed often acknowledges that you are suffering with your nerves. You may be worrying about everything and anything. There may be something in your past that has caused this or it may be current. If it is in your past then you need to deal with it before you can move on. Migraine headaches may be present which are often the result of mental stress. **So who will they want to stick their Sword into? Visit Card 2 to find out. Hello Vivien! Thank you for this wonderful and profound content on the Cards! I was wondering what Ace of Swords for one’s life purpose could mean? I’m an aspiring astrologer and tarot reader with a drive to learn. Maybe it could literally mean a “breakthrough” in a chosen field? Thanks a lot for your insights! This Ace of Swords highlights your burning ambition and drive. You have the ability to make a success out of anything you put your MIND to. You are also an intellectual and although you aspire to being an astrologist and tarot reader, I get the feeling you will retain a very analytical approach and want to study these subjects in depth. You are a seeker of in-depth knowledge, not superficial stuff. You should also have a flair for writing with the Ace of Swords, so think about blogging about your Findings and knowledge. Thanks Vivien! You gave me additional insights on the Ace of Swords. Hello Vivien! Thank you for this great take on the Ace of Swords! 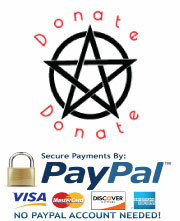 I donated to your website so that you can continue writing this beautiful in-depth content on Tarot. What do you think an Ace of Swords could mean as someone’s life purpose? This is late in responding and I am so sorry. Thank you so much for your donation. You are very kind. That Ace of Swords is a wonderful card. I would hazard a guess you are very ambitious and have great plans for your future. The Ace of Swords I feel sees you breaking new ground, finding new ways of thinking, new solutions. The Ace of Swords will lead you to question everything, to challenge those who would seek to stand in your way. You are a truth seeker, fair, just, honest. You will seek to encourage that in others. The Ace of Swords unlocks the potential of the brain, the intellect, logic, reasoning and rationale. You will be thorough and leave no stone un-turned. Your potential is infinite, just like the intelligence of the mind the Swords Suit symbolises. You may have work to do in the field of science, maths, medicine, law, politics. You will be the seeker of answers and solutions whenever you come across problems or issues. Your life purpose may also take you into the realm of the written and spoken word. You might want to become a writer, blogger. There is a very active brain, which communicates well. The Ace of Swords brings so much potential as a Life Purpose. Because it is a Minor Arcana card, I feel there will be variety, a changing environment in which you will move and evolve. I do not see you fixed in one area as this may limit your potential. You have many interests and are very intelligent. Academically you can achieve anything. Watch out for stress. Find a way to turn that mind off occasionally and learn to relax. The Ace of Swords will remind you to keep your mind sharp as you age. Never stop using it, never stop learning. Use it or you will lose it. Do as much as you can with your intelligence in this life but do not wear your mind out. Keep it refreshed and up to date with our ever changing world. Oh I could go on, but will stop there. I hope the above sounds encouraging. 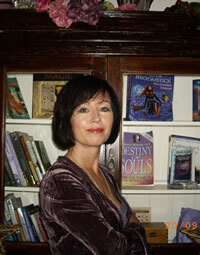 A great many thanks for your encouraging interpretation of the Ace of Swords as a Life Purpose. I confirm that with the Ace of Swords you are ambitious both academically and professionally and you don’t want to be limited to a specific area for long. Only after reading your reply I realised that doing the same thing my whole life would be equal to death! By 30, my academic studies ranged from Law for 2 years to M.Sc. in International Management and then Finance, Statistics & Big Data at MIT. I also learned website building from scratch and was a passionate blogger for 2 years. I graduated from a music school (piano) and sang Opera for 2 years. I also enjoy foreign languages and speak 4 fluently, which I learned for my career. Not to mention Astrology and Tarot as my hobby. Now I’m interested in maths and reading a book on a fundamental dilemma of mathematicians on prime numbers! However, I also confirm that with all this activity of the mind there can be a danger of mental exhaustion, stress and informational burnout. What do you think, maybe an Ace of Swords is also a sort of a life challenge (as it is usually the case with the Swords suit), for example learn to gain objectivity and detach from emotions, develop sharp and flexible mind, even heal from potential mental problems? Also, constantly changing careers could have its negative side too, don’t you think? To mitigate this challenge and find something more stable and long-lasting, I asked the cards “What is the most fulfilling area to work in, emotionally & financially”, and got… the Lovers! My take on it would be an area that has something to do with creating harmony, maybe involving a like-minded and supportive partner. Mix it with the Ace of Swords, and you get a…therapist of some sort? There is a kind of a “larger than life” feeling to it because of the angel on the card, don’t you think? I am also extremely curious about your card as a Life Purpose, as you are a very talented, I would even say unique, writer in the Tarot world. Beautiful description, very thorough &detailed meaning of all points.Great input of each card&explaining in systematic way. Difficulty to grasp &retain all information &needs lots of patience &perceversnce to re produce.Explain how to go about through Intution&through Divine Guidance. Hi Rajshri, Thank you for your lovely comment. Regarding interpreting through intuition and Divine Guidance, I am not sure there is a guide book that will show you the way. The only thing I suggest for intuition is to sit with the cards for some time and begin to make connections. If you are good at typing then begin to type up the first thoughts or observations that come to you. You could also record them into your phone or write them down. This often opens the flow of intuitive impulses. Don’t try too hard, but work with what comes to you, instead of what you think you should be seeing or thinking. Intuition is linked to the imagination so you must work on developing your imagination so that it can communicate with your intuition. Your imagination is the outlet or voice for your intuition so they need to work closely together. To read intuitively, you need to allow abstract thoughts into your mind and not overly analyse them. Feel it through your stomach, in your heart and not so much with your head. Be very aware of the reactions in your body when observing the cards as your intuition will speak to you in this manner too. Don’t readily dismiss observations about the cards that you think are silly or crazy as they are likely to be coming from your intuition. You then need to channel them into something coherent. When seeking intuitive interpretations from the cards, a good idea is to view the card as animated instead of static. Jump into the scene and take a walk around and see what is going on out of frame. What is happening, where is everyone going to, what are they saying, why are they here? As for Divine Guidance, perhaps create a very meaningful ritual of cleansing and protection before reading the cards. Prayer and mindfulness beforehand might be beneficial. I do hope this has helped.